I love grilling chicken thighs and have them at least once a week in our house. I’m always looking for new ways to serve them since we have them so often and on the lookout for tasty new ways to season them. When my parents came back from vacation in St. Martin they were raving about how the French and the Dutch chefs there cooked their BBQ. 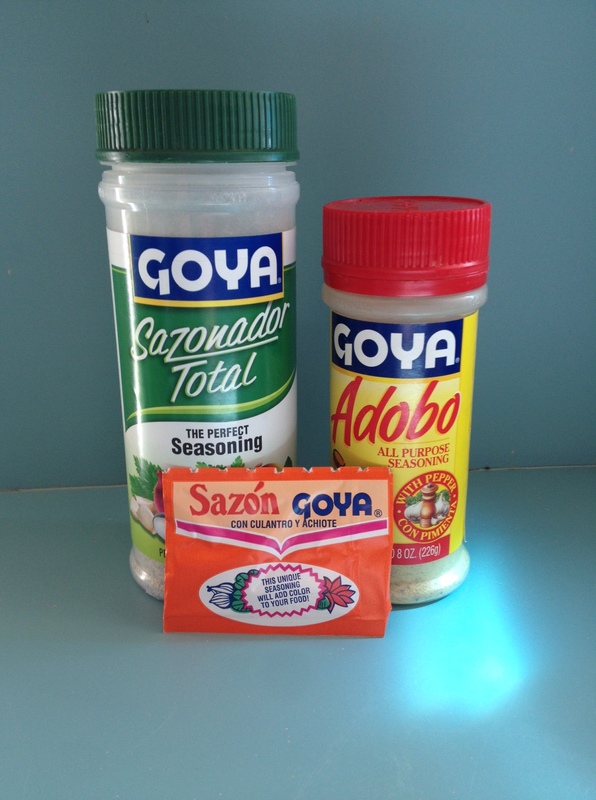 They use Spanish style seasonings (GOYA brand) on their meat before grilling and the unique blend of seasonings gives the meat a really delicious and different flavor. My parents are foodies and whenever they travel to new places and eat something tasty they almost always find some way back to the chef and get his recipes out of him. I can’t tell you how many times my mom has come back from vacation and spent half the time talking about her vacation telling me about all the new foods they tried and recipes/ideas they’ve brought back. 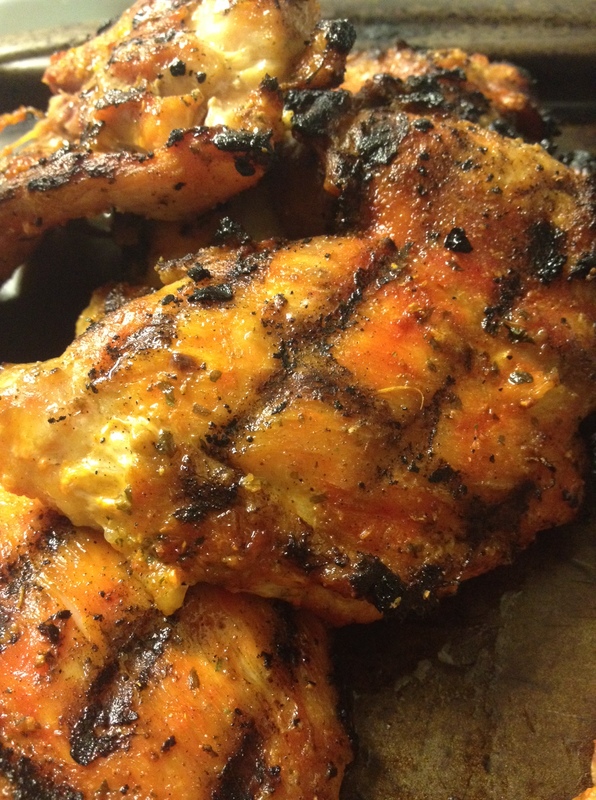 This grilled chicken thigh recipe is so simple anyone can do it and only requires three seasonings. 1. I like to season my chicken first thing in the morning after I wake up so the chicken has all day to marinate in this yummy goodness before I grill it. It’s not 100% necessary, but it sure does make a difference in taste I think. I like to line a cookie sheet with foil and spray with cooking spray and season both sides of the chicken liberally with all three seasonings. Once both sides of chicken are seasoned cover with plastic wrap and place in the fridge until ready to grill. **Note** Use 1/2 of Sazon packet on one side of the chicken, 1/2 on the other. – Get your grill going and either cook on grates of grill or cook on foil piece chicken has been sitting on that has been sprayed with cooking spray. Cooking directly on grates will leave grill marks and give the outside a little crustier texture and cooking on the foil will leave chicken slightly juicier and no grill marks. It’s really up to you how you like your chicken. – If you don’t have a grill you can cook this in the oven leaving chicken on foil and cookie sheet at 425 for about 40-45 minutes. Pro Tip: Don’t use coconut oil on the foil if you’re planning to use that same foil on the grill. So true 🙂 Always use an oil with a high smoke point like peanut, canola, etc. Coconut oil is really better for baked goods.